The Testimony of Three Witnesses in the 1830 edition of the Book of Mormon was originally included at the end of the book, as a final seal of its veracity. 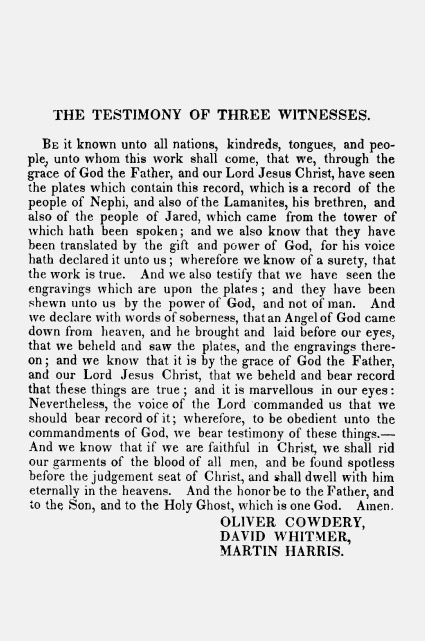 These witnesses—Oliver Cowdery, David Whitmer, and Martin Harris—testified that they had heard God's voice declare that the book had been translated by the gift and power of God, and also that they had seen the engravings on the plates, shown to them by an angel of God. Ancient documents often needed the signatures of witnesses in order to be considered authentic or legally binding. By providing the testimonies of witnesses and including them at the end of the Book of Mormon, Joseph Smith was following not only the ancient pattern called for by Nephi, but also the guidance and inspiration of the Lord.